Merry Christmas, everyone! I decided to give a crack at making my own vegan biscotti this holiday season. I haven’t had that much time to bake, but this recipe made a lot, so the cookie jar has been happy. This recipe was inspired by a recipe in “Christmas Cookies: 50 Recipes to Treasure for the Holiday Season” by Lisa Zwirn. The cookbook was given to me last year by the owner of Life of Pie, where I was helping out with the Christmas madness during my break from school. This year I got to try out a recipe. An extra 1/4-1/2 cups water. * If you use unsalted, add about 1/4 tsp salt to the dry ingredients. I had a hard time finding peanut-free unsalted pistachios, and had salted ones on hand, so I rinsed them thoroughly and omitted the salt. That worked pretty well. I started by making a chia seed egg by letting the 8tbsp of water and chia seeds soak for five minutes. I preheated the oven to 350*F. Separately, in a medium bowl I mixed together the flour, baking powder, (salt), and cinnnamon. In a large bowl I used an electric mixer to cream the coconut oil, then beat in the sugars until fluffy. I then added the chia egg, vanilla, and orange zest. I mixed in the flour mixture little by little. Lastly, I stirred in the pistachios and cranberries. Seeing that the original recipe used 2 large eggs, which have a lot of water in them, I noticed that my dough needed extra water. So, I added about 1/4-1/2 cup of water, little by little and stirring between each addition, until the dough was wet enough to gather into a ball. I made two balls of dough and placed them on a cookie sheet lined with parchment paper. I shaped each ball into a long rectangular shape, measuring 13 inches long by 2 1/2 inches wide. The loaves should be about 3 inches apart. The loaves were baked for 30-35 minutes, and the pan was rotated at the half way point. I took the loaves out and let them sit for about 10 minutes, and lowered the oven temperature to 325*F. After 10 minutes, I transferred the loaves to a cutting board and used a bread knife to saw the loaves into 3/4 inch-thick pieces. I placed each piece back on the cookie sheet, facing the freshly cut sides down. I baked them for 10 minutes, then flipped each piece to the other freshly cut side, and baked them for 10 minutes more. They were taken out of the oven, and enjoyed in various ways: with hot chocolate, coffee, hazelnut spread, and just plain (as my mom would probably like them). 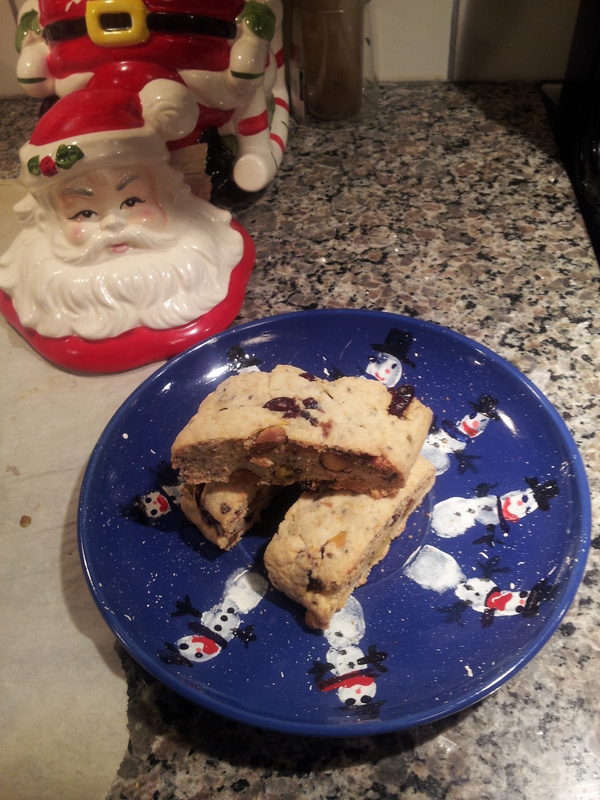 This is a picture of the biscotti on a plate that I made my dad when I was a kid, and the cookie jar in the background. Santa’s head is the lid of the jar. Merry Christmas! I wish everyone a safe, relaxing, and joyful holiday.